The exhibition was held in the Rare Books Exhibition space, Sir Louis Matheson Library, Monash University from 22 June - 5 September 2011 Opening address given by Dr. Joel Crotty, Senior Lecturer, School of Music, Monash University. Before recordings and radio conveyed the latest popular tunes, sheet music was the means of mass marketing the latest musical vogues and hits: Charles K. Harris's 1892 song, After the Ball, reportedly sold 5 million copies. 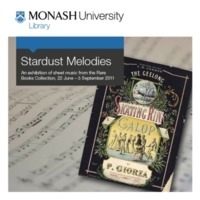 Sheet music, and illustrated sheet music in particular, preserves an evocative record of our musical, cultural and social past. It is also a repository of personal memories, especially – in the words of the song, "Stardust" – 'the memory of love's refrain'.